The program for this album places it in Easter in 1043, when Edward Wessex, son of Æthelred the Unready, was crowned king at Winchester Cathedral. By one of those curious flukes of history we have an unusual insight into the music that was likely chosen for performance: a small but substantial manuscript that survives of a cantor’s work beginning in the 1020s, copying pieces that lay beyond the required chants for standard use. Included are both more sophisticated chants for Easter and processional works intended for such events as coronations. So while we can’t be sure all this music was employed to the Glory of God and Kings on that Easter of April 3—a moment’s peace, perhaps, for Edward, already planning to gather back power from his large, grasping family—we can surmise that at least a fair amount of this material was heard by him there. The inclusion of two modern works may prove a sticking point for some potential buyers. According to Discantus, the two composers were given “playing rules” that included writing for six women’s voices, utilizing excerpts from The Consolation of Philosophy by Boethius as their text, and composing within the context of an 11th-century context. The last’s the rub. It would be a rare 21st-century composer offered such a commission that didn’t deploy period devices or modes except in the broadest, most modern fashion, so as not to be accused of turning out ersatz-Gregorian chant and polyphony. 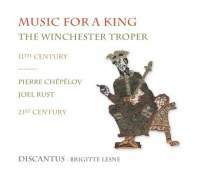 But listeners who want the Winchester Troper sound world may not be pleased with the strongly modern flavor of Chépélov’s O qui perpetua, and Rust’s Sunt etenim pennae. If that’s the case, the 62:59 of enjoyable music on this album shrinks by 13:07 to 50:06. That noted, I find the second major section of O qui perpetua, starting with “O qui perpetua mundum ratione gubernas,” especially attractive with its intoned passages in third under a wordless soprano in full flight, the harmonies much in the vein of Kodály’s wordless choruses. The opening section of Sunt etenim pennae, by contrast, is a beautiful solo passage whose ever-shifting polytonal characteristics are a musical play on the words, “Yea, I have wings to fly.” Both works are attractive, but whether they belong on a disc of 11th-century music must be for each person to decide for themselves. I have nothing but praise for the performances of Discantus under Brigitte Lesne here, notable as usual for their disciplined intonation and phrasing, and beauty of tone. The text is enunciated with great clarity, despite the moderate cathedral-like resonance (which, for once, makes perfect sense in context). Lesne employs a recent edition of the Winchester Troper (based on Cambridge, Corpus Christi College, MS 473) by Professor Susan Rankin. With texts supplied in the original Latin and Greek, and translations offered in English and French, this is a disc to treasure. Strongly recommended.